Swift is the new programming language brought to you by Apple last year. It brings a refreshing air of novelty to the world of C, Python, Ruby, Rust and Go. The language is neither as beautiful as Python nor as fast as raw C, and the compilation speed cannot compete with Go. But the motivation behind Swift was to hit the sweet spot between C, Python and Go. I strongly recommend reading the Swift Book for example here. Swift is not Open Source yet. Booo! Technology underlying Swift is based on LLVM, which handles all of the data structures, all compiling and optimization tasks on its own. LLVM is used also by PyPy, CLang, and other languages as well. Is it really as fast as advertised? Note: I haven’t used the list comprehensions, not to favor any language. I will prepare this variant later. As you can see, the Go code is the longest one, but not much longer that the others. The source code is fairly short whatsoever. But that mandatory package() and main functions requirement is enforced. The weird part of Go is that Rob Pike decided not to make Print a keyword, but rather a library function. That’s why you should import fmt module. Appart from that, array functions are quite limited in comparison to Python and Swift. By default, Go’s arrays are not resizable - as in C. Go language provides append keyword for resizing arrays but the creator of Go couldn’t make up his mind how to implement single vectors. For example, you can use Slices pattern. WTF. After 30 years language designers should provide one efficient generics implementation! But let’s move on. The way we declare the variable is bizzare - inside for loops you declare local variable without var. On the other hand, outside the loop you can still use two options interchangeably, a := 1 or var a = 1. As you can see, it is pretty incoherent. The good part is that the compiler is fast - it’s the fastest compiler I’ve ever seen. Basically, it feels like an interpreter(but it’s not interactive). You can even run go run to hide the compiling step. Swift has type inference everywhere as well, hence the short syntax for type definitions. append() is a method, not a keyword, just like in Python. The thing I love is that an optional OOP is not enforced on you. No package, no module, not even main function required. Furthermore, adding a header #!/usr/bin/xcrun swift followed by chmod +x test.swift allows us to run ./test.swift without compilation, just like in Python. Wow. What else? Println and print are keywords. Your fingers will appreciate it for sure. I really like the Range operators, which are lazy evaluated, and handle custom iterations steps in performant manner. Arrays work as expected and live interpreter has nifty editing capabilities, which is so much better than in Python (multiline handling). Editing capabilities are even better thanks to excellent type inference. I really love Python, but the lack of optional typing, type inference, and compilation is definitely lacking here. But here is where the language shines - the source code is the shortest of all and the cleanest of many. var y: Array<Int> =  looks really iffy in comparison to the simple y =  in Python. But in Swift we can emulate that writing var y : [Int] = , which is slighty better on the eyes. I really love the Python clarity here. xrange operator is here with a similar purpose as Range<Int> in Swift. I’ve run loop 30 times. The results are mixed. CPython required 35x more time to finish the benchmark. 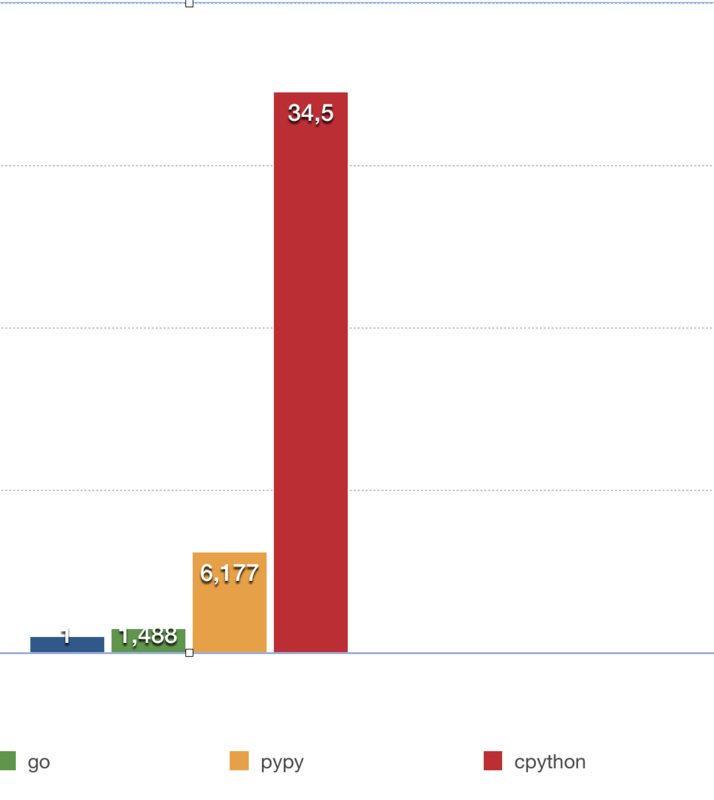 Yes, it was 35x slower than Swift! 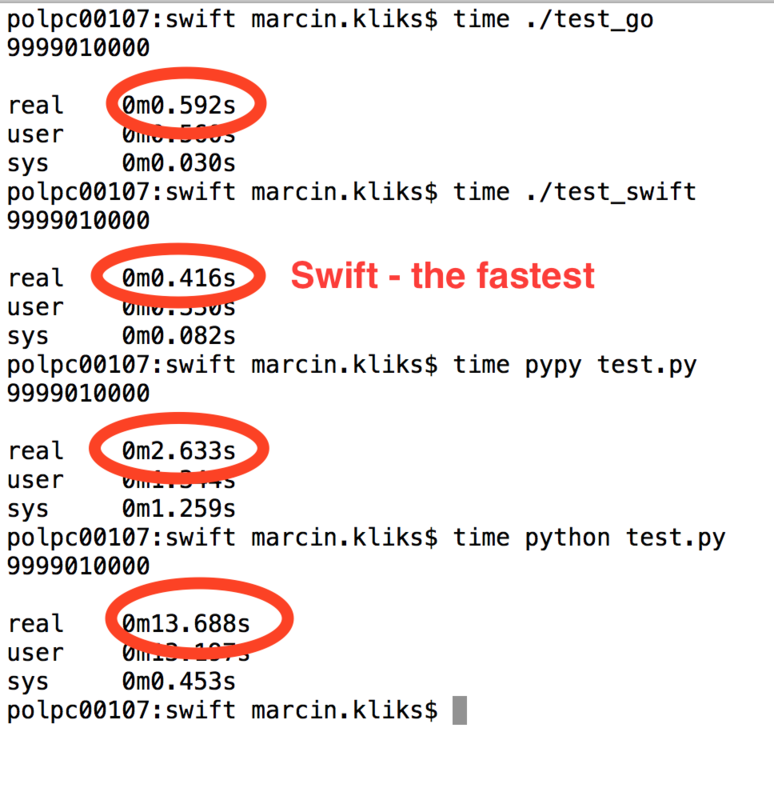 On the other hand, Swift and Go come so close in results that it doesn’t matter - but in this particular microbenchmark Swift was 60% faster than Go. It trully amazed me how performant PyPy was - more than 5x faster than generic CPython implementation. Wow. In this particular test - Python is 34x slower than Swift. 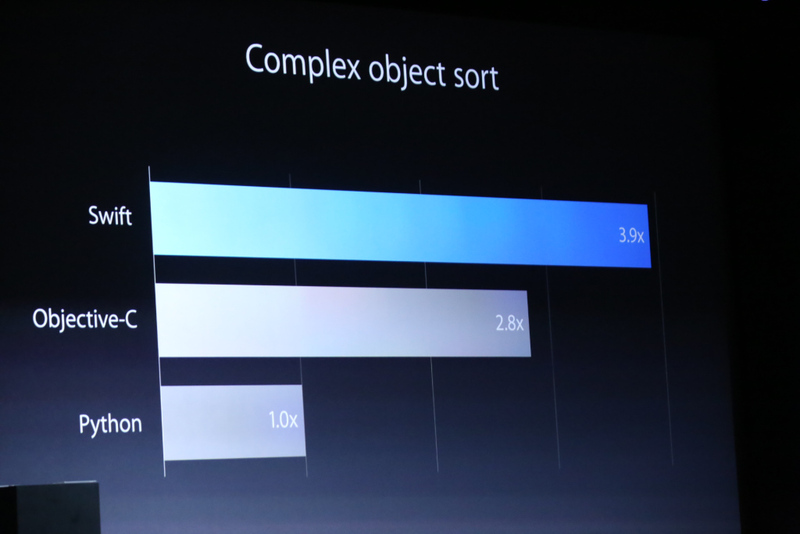 Swift performance looks like a good fit not only for scripting, but high computing purposes too. I liked its type inference. Swift being faster than Go is quite surprising because Go is 3 years ahead of Swift in public development. I can’t wait to see ! [Chris Lattner][http://nondot.org/sabre/] open-source Swift.